Much of the strength of the IDE lies not in the IDE itself but what can be done with it once you’ve installed packages, themes, and so on. Since I’ve been using it, I’ve written a few posts about it (which I’ll share at the end of this post). Though now that some time has passed, I thought I’d share some of the Atom packages for WordPress developers that I recommend (leaving those out that I don’t). Codebug. This is especially useful if you’re a fan of Codebug App. Sure, there are a few more packages I have installed, but these are the ones that I would recommend to others who are looking specifically for Atom packages for WordPress development. Furthermore, some of the packages above, like Markdown Preview Plus, help to work quickly on standard Markdown files without the need of yet-another-app to set up for something that Atom can already do. 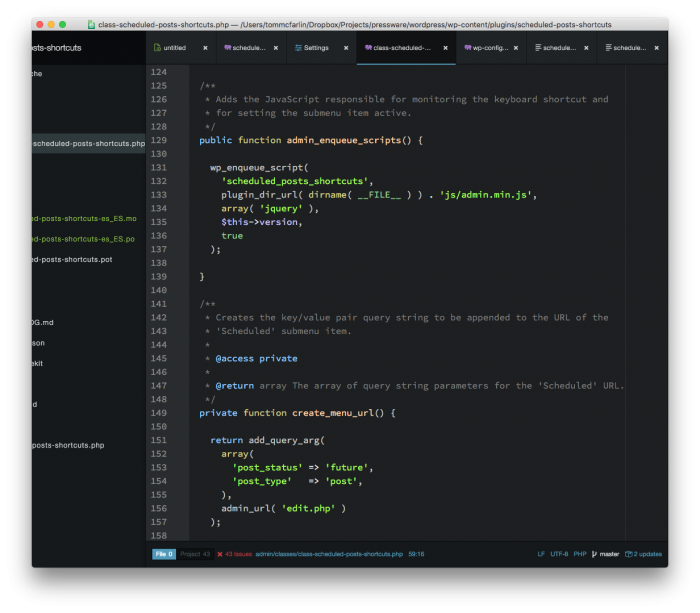 Concerning the UI, I’m a fan of the Seti UI theme and the Atom Dark syntax theme. Using PHP CodeSniffer with Atom. If you’re building anything for WordPress, then I can’t recommend using the PHP CodeSniffer with the WordPress rules enough. 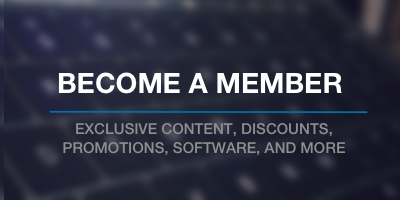 You should be following the WordPress Coding Standards, and this will ensure that you do. Syncing Atom Settings Between Computers. There is a package for this, but I’ve had mixed results with it. I’ve found that using a symbolic link with Dropbox is much more resilient when it comes to syncing all of your settings, packages, themes, and so on. And if you have anything to add (or ask), then don’t hesitate to do so in the comments below. I’m always on the lookout for yet another package to replace something I have or to install in addition to what I have to make development that much more streamlined. Perfect timing for this post! 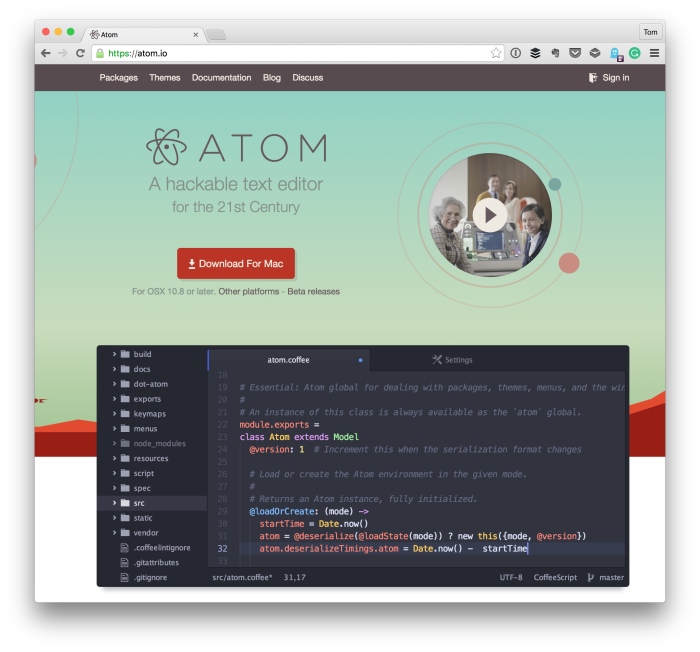 I’m finally getting around to taking a closer look at Atom and like what I see so far. Configuring it was first thing on my todo list today so I’m sure this will save me some time. Have you or do you use Emmet with Atom? Great! I’m a fan of it and there are plenty of other people in WordPress who have their opinion of it, too. Some dig it, some don’t. But that’s okay. Whatever makes you happy and helps you get work done :). I’ve not. I just checked it out but I’m not sure I have a use for it right now. If I could find “anything” with a better snippets library than Dreamweaver then I might think about making the switch. I’ve been using Dreamweaver for 16 years, and change is hard. I realize most laugh, especially the younger crowd, but the amount of time spent having a snippets library vs an “auto complete” is just hard to throw away. I’ve tested them all (except PHP Storm). So as embarrassed as I am to admit I still use Dreamweaver, I figured I’d see if anyone has a better solution. Or at least something I’d be open enough to give a try. 16 years is a long time. I didn’t even know Dreamweaver was still maintained, TBH. I remember using it back in the day, but I’ve gone simpler and simpler with text editors over time. When I was working with .NET, Visual Studio was an awesome piece of software. There are aspects of it I still miss. I’ve given PHPStorm numerous fair shakes but I have my own grievances with it such that I finally settled on Atom, a set of packages, Codebug, and a couple of other things and I’m happy with what I have. This may change in time. Who knows. Nah, don’t be embarrassed. We all have our things that we use that might be dated to others. Maybe someone reading the comments will have something to bring it, too :). How does it feel (speed/responsiveness/ease of use) compared to ST3? Are there any features/packages you miss from ST? To be fair, I’ve used ST3 only a little bit so I’m not sure I’m the best person to talk about in terms of how it stacks up. It is a responsive IDE. Certain packages might slow it down a bit, but I’ve no complaints, for whatever it’s worth. I’ve had frustrations in the past with other IDEs. The only main complaint I’ve heard was from someone who prefers to use vi as their IDE. True story :). I never installed enough to really miss enough so I’m not a good person to answer this particular question :). Thanks! I tried atom in beta, it was sluggish, at least as slow as PHPStorm, maybe slower. I’ve heard from at least one person it’s different now though. I now a few VIM holdouts myself. If the tool you know works well, why change. It’s hard to justify the time investment to learn a new tool if it doesn’t dramatically change production speed. A number I keep in my head is that 4 hours roughly translates to a minute per work day for one year. So a four hour training investment needs to save you a minute every day to pay off (way more goes into it, but its a useful de-abstraction). Thanks! I tried atom in beta, it was sluggish, at least as slow as PHPStorm, maybe slower. I’ve heard from at least one person it’s different now. And I’ve been here since. I have been wondering the same thing if there is anything in Atom that beats ST3. No one has yet came up with a something that would make me shift. I’m not out to try to convert anyone from ST3. I’ve not really used it much so I have no means by which I can provide a solid compare/contrast post. Nor do I think I’d be interested in that. Kyle, you’re not alone, I’ve been stuck on Dreamweaver since it was first introduced in the 90’s. It was a big deal, Macromedia sent reps to thousands of companies with free copies. Still getting used to Sublime and really, really want to like Atom because the “free and hackable” thing is wonderful. These articles are definitely helping. Thanks for this – it’s going to save a lot of time. I was using Brackets up until a week ago, but have switched to Atom because of some performance issues. Not 100% sure I like Atom more than Brackets yet, but these packages should help make up my mind. Yeah, I think it takes time to determine which you like more. I’m not dogmatic one way or the other. Try ’em out and see what you like then stick with that one! I have primarily worked with phpstorm. What is your opinion(if any) regarding or in comparison to Atom. I honestly prefer it – I used Coda/Coda 2 for around 18 months, and then switched to PhpStorm for about the same amount of time. I’m on ~ month 6 with Atom, and after setting up phpcs and other linters, I honestly don’t miss it. Atom’s so much faster and has less interface bloat – the only thing I miss about PhpStorm is the integrated SFTP functionality (I know there are plugins for this, but none of them I’ve found offer the same syncing functionality that PhpStorm did). They are a good bit different. PHPStorm offers a lot. Atom is pretty minimal. You have to add packages to Atom to gain functionality. You usually have to toggle options in PHPStorm to tailor it to your needs. I’d not recommend one over the other to anyone. I’d generally just say to try them both and stick with what you like most :). That’s what I’ve done. I’ve recently written a package called wp-debug-watcher which watches the WordPress debug log and gives notifications of the new lines, which is especially helpful in my local development process. In case you’re interested. I still need to build out the readme, but otherwise, it’s very usable and streamlines my work flow. I know it’s not WordPress specific, but the sync-settings plugin (https://atom.io/packages/sync-settings) is a godsend. It backs up your entire Atom config to either a public or private GitHub Gist. New machine = Atom up and running exactly as I had it in less than five minutes. I’ve had some very mixed experiences with SyncSettings so I use a symbolic link to my Dropbox. It basically does the same thing, but I’ve had fewer hiccups with it. Thanks for sharing these! Always looking to add more to the arsenal of useful packages :). I’m still on Coda 2. Atom looks good, but I’m still not convinced on making the move. What drove you to try and switch to Atom? The lack of updates to Coda, the speed of Atom (not necessarily the releases, though they are fast, but the literal speed of the editor), the sheer variety of themes and packages, and the way I could easily share settings between multiple machines were a few of the reasons. Cool article, I use RebelChat https://atom.io/packages/rebelchat for chatting, you can add Slack, Skype, HipChat and chat right from the Atom.